Summer time, and the fishing is easy … at least it is if you follow Deeper Hero Nick Kost’s incredible tips for summer bass fishing. He’s put together a comprehensive guide to his favourite summer bass fishing lures and techniques, plus 5 great tips for summer bass fishing success. People like to break down fishing into different seasons for many reasons. Remembering past experiences when fishing in particular conditions during certain times of the year can make or break a day on the water. Fishing in Ohio can be rather challenging because weather conditions are very unpredictable. Spring, Summer, Fall, and Winter arrive at different weeks and even months every year, so the ability to adapt to the current situation is the key to being successful. 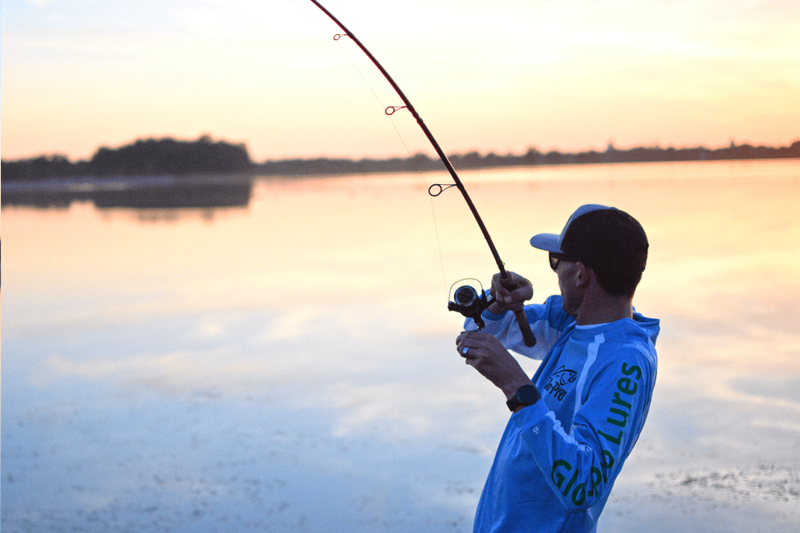 Summer fishing can be the most productive time of year if you follow this simple rule … be yourself. Summer is the only season where every technique is on the table. Every angler is unique, with their favorite techniques, baits, and locations. Let me show you my 5 best summer bass fishing lures and techniques. I love to throw weedless, Texas rigged flukes into heavy grass. Why? During the summer when the temperatures spike, fish need to find cover to stay cool. Grass also provides them with a great ambush point when they are hunting prey. While some may approach grass differently, year after year flukes have been proven to be more successful than any other approach. I like to position myself with the wind to my back and cast high in the air, allowing the wind to maximize my casting distance. In all facets of fishing, one of the most important things I need from a bait is the ability to cast it far. I slowly move the fluke through the water by a series of gentle twitches, then a 3-second pause. I like to flutter the bait through the vegetation – the bait will hang upon the weeds, kick up particles and cause noise, which will catch the bass’ attention. If you fish a fluke that is weighted, it sinks to the bottom too fast. With the bait being weightless, it will suspend on the weeds, leading to an easy target. My go-to fluke is made by Zoom – the Super Fluke has been the most productive in my experience. The color really matters. I like to give each color fluke a ten-minute window to produce results before switching patterns. Experiment with a light and dark color profile first, then improvise from there. I use a 3/0 hook paired with heavy 30-pound braid. I have also had success with a new bait company called Nextgen – they also make a great realistic fluke that includes an internal rattle. Before you cast it out, drop the bait right in front of you and see how it reacts in the water. Paint a mental picture of what your bait is doing in the water - that way you can visualise the bait’s motions and will be in full control of the retrieve. Some anglers just use jerkbaits as a search bait, but I use them all the time. When the temperature rises in the Summer, bass need to protect themselves from the heat. They have 2 choices, take shelter in cover, or move out to the middle of the lake for deeper and cooler water. In my experience, bass like to suspend just above the thermocline in the Summer. A thermocline is a transition layer between warmer water that is heated from the sun and the cooler water below. I use my Deeper PRO+ to locate schools of bait fish, structure, grass, and points, around the 10-15 foot depth, and target that area. My go-to is a Rapala X-Rap 4 ¾. The color of the bait is really dictated by the water conditions. If the water is clear, I generally go with a lighter more natural pattern, whereas with murky water I choose a darker color or something neon. I prefer suspending or slow sinking jerkbaits over floating jerkbaits in the Summer. Suspending jerkbaits usually weigh more which generates a greater casting distance, and also stay in the strike zone longer since they are not floating to the surface. Floating jerkbaits do have there place when fishing areas where there are only a few feet of water between the surface and heavy weeds below. I have watched many pro anglers cadence (in other words, when to move the lure and when not to) when they are jerkbait fishing, and each angler has a different retrieve method. My favorite standard retrieve is a jerk, 1-second pause, then a double jerk, reel in, 1-second pause. I start with a 5-foot running jerkbait, then gradually move down in running depth. I like to target transition points and creek channels in the Summer. Look for areas that have a structure where two different sections of water meet, or where a certain channel narrows significantly. Once you catch a fish, fish that area hard. I always switch up my cadence once the bite slows down. Experiment with different speeds and pause times. When I fish jerkbaits I follow a certain code of importance - depth, speed, size, color, action, in that order. In general, I apply this code in all aspects of fishing, but for choosing a jerkbait, I find it to be the most beneficial. When fishing heavy floating vegetation and a weedless bait is needed, I use a topwater frog. Some people may limit themselves by only fishing them in the early morning or sundown, however, frogs can be productive all day long when utilized correctly. There are 2 different styles of frogs, and I fish them both a certain way. Popper style frogs have a cupped mouth that splashes up water on the retrieve. I throw popper frogs when it is windy, or over open water. I like to retrieve them slowly – a series of 1, 2, or 3 twitches, then a long pause. The bass will mostly strike the bait on the pause, so be patient. I also add a scent to the bottom of the frog, that leaves behind a scent trail, and it also could be the difference between a strike on an indecisive bass. My favorite cup style frog is Glo Pro Lures new Aggie Froggy. The Aggie Froggy is the perfect size, and when paired with the feet skirt, it is overall my most productive bait. Any frog without a cup I like to use in heavy vegetation. When surveying the water with heavy vegetation on the surface, look for small areas of open water. I refer to these as “blow up holes”. Try to position yourself in line with as many blow up holes as possible. Use a steady retrieve in while the bait is running on top of the weeds, then pause it when you reach a blow up hole. Bass will track the bait under the vegetation and wait for the perfect chance to strike. Once the bait hits a pocket of open water, it will take advantage. Although bass will typically strike the lure when it is paused in open water, they will also hit the bait right through the weeds, so be prepared for a hit at any moment. Lunkerhunt makes a great hollow body frog to use in these conditions. The only drawback of fishing weedless frogs is the hook-up to bite ratio, with most hollow body frogs that use a double prong hook falling into this category. The main issue I have found is that most people set the hook too early, right when the bass strikes. This often results in a missed fish. Instead, wait a second or 2 before you set the hook. This allows the bass to swallow the frog deeper in its mouth, leading to a more likely hook-set. Be aware that sometimes bass like to hit the frog out of the water to stun it – this immobilizes the frog for a few seconds and gives the bass time to circle around to make the kill. When fishing floating vegetation with a frog keep this in mind - the bass might not know it is a frog. All they see is a profile of something moving, so the fish does not know exactly what your bait is - it could be a wounded bluegill struggling in the weeds, or a snake or mouse. Fish do not have hands that they can use to reach out and grab something to examine it. The only tool they have is their mouth.